Explore AMESim 1D Live – Get hands on, technical training with us. At our event, a laptop will be provided to every attendee to follow a light ½ day training session on LMS Imagine.Lab AMESim, a simulation software for the modelling and analysis of multi-domain systems that allows you to create a simulation model for a system very early in the design phase. On the day you will build a hydraulic circuit, add control then explore how slight changes to diameters, temperature and valve rates can greatly effect the stability of your design. This example is transferable for many other scenarios and will aid your understanding of how your company could utilise AMESim. In the afternoon, we will run a surgery where you can bring your own system/s and our engineers will review them and help support you through any developments or challenges you may have. 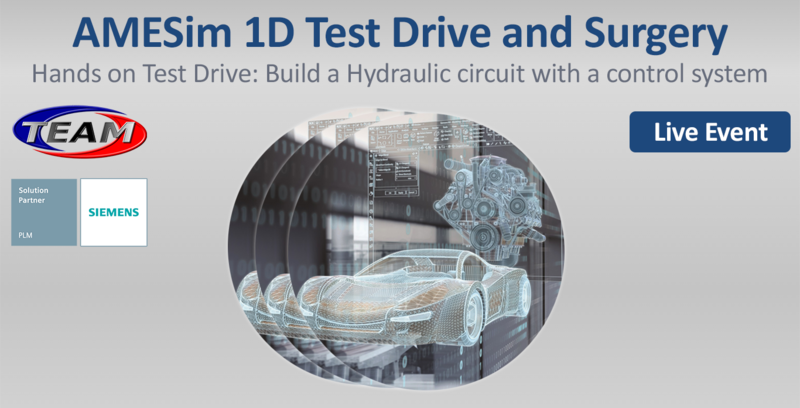 We’re the first Siemens PLM Software partner in the UK to hold Live Training events like this for AMESim so get ahead by attending whilst spaces are available. We’re here to answer your questions and assist your learning & interest in simulation modelling. The event is on 4th October and will run from 09:30 to 15:00 at Siemens PLM Software UK office. Free on-site parking available. For the agenda and registration, click below.